When I saw a link to this recipe (from Real Simple) on Cassie Craves, I knew I had to try it. 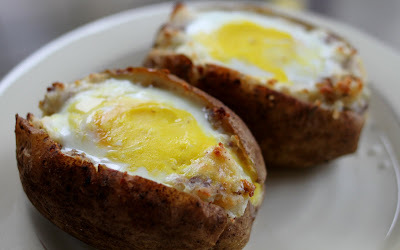 It's like a little breakfast casserole right inside a potato :-). Ella and I were definitely fans! You could mix it up with all kinds of substitutions or add-ins too. I want to use ham and green onions next time! I'll probably scramble the egg up a bit too...it won't be as pretty, but I think it would taste even better. I baked potatoes according to these directions. Scoop out the insides and stir in the butter and cheese. Fold in the sausages. Spoon the mixture back into the potato halves, creating a hollow in each center. Break 1 egg into each hollow. I'm intrigued. Gonna have to try this one! What a neat idea!!! Bookmarked!! !